Combine white chocolate chips with 1/4 cup of the heavy whipping cream in a microwave-safe bowl. Heat on high power in increments of 15-30 seconds, stirring after each until melted. Let cool for 5 minutes. Combine remaining 1 1/4 cups heavy whipping cream with powdered sugar, and vanilla. Beat to stiff peaks. Pour lemon yogurt into a bowl and the key lime pie yogurt into another. Equally divide the white chocolate mixture between the two bowls. Stir to combine. Fold 1/4 cup whipped cream into each of the bowls of yogurt. Color lemon mousse with yellow food coloring and the lime mousse with green and yellow. Spoon lemon mousse, lime mousse, and the whipped cream into three disposable pastry bags or zip-top plastic bags. Assembling the parfaits: Crush the vanilla wafer cookies into crumbs. Stir in the melted butter. Spoon 1/2 tablespoon of cookie crumbs into each of 12 mini parfait glasses. Pipe a layer of whipped cream on top. Pipe a layer of lime mousse and then a layer of lemon mousse on top. Repeat adding another layer of cookie crumbs, whipped cream and lemon and lime mousse. Pipe a swirl of whipped cream on top and serve. Use frozen whipped topping in place of the fresh whipped cream if you’d like to keep these refrigerated for more than a few hours. Need a quick and easy treat to serve at a spring or summer party? These Mini Lemon-Lime Parfaits are so bright and cheerful that they would be perfect. In less than a half an hour you can have 12 of these tiny desserts ready to serve. 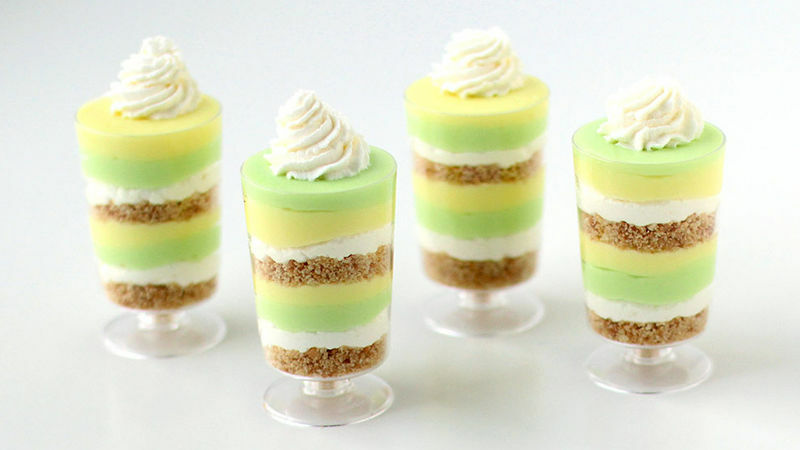 Each brightly colored yellow and green parfait is layered with vanilla wafer cookie crumbs, whipped cream, lemon and lime yogurt mousse. They are light and refreshing and make a wonderful end to any meal. Grab the ingredients you'll need to make your parfaits. Start by making the decadently creamy white chocolate yogurt mousse in lemon and lime flavors. The mousse will look very pale at this point, so mix some yellow food coloring into the lemon mousse and some green and yellow coloring into the bowl of lime mousse. Spoon the lemon and lime mousse along with the whipped cream into disposable pastry bags. This makes assembling the parfaits super fast and neat. To assemble the parfaits start by spooning in some cookie crumbs. Pipe a layer of whipped cream over top then add a layer of lime and lemon mousse. Repeat creating another cookie crumb layer topped with whipped cream and the lemon and lime mousse. Pipe on a swirl of whipped cream. To make the swirl look really pretty, you can add a star pastry tip to a clean pastry bag, fill it with whipped cream, and pipe on a swirl. Your parfaits are ready to serve.